A man was trapped in the lift of Portsmouth's Spinnaker Tower for more than an hour - on the day the troubled structure finally opened to the public. The external glass lift jammed 100ft (30m) up trapping the city council's project manager, David Greenhalgh. 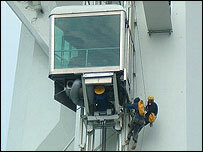 Abseiling engineers were called to fix the lift, which has now been grounded, and release Mr Greenhalgh. Problems with the lift earlier delayed the opening of the tower, which is five years late and £11.1m over budget. Mr Greenhalgh said he was "exasperated" and "frustrated" when the lift got stuck. "The bottom of my stomach dropped, I didn't want it to happen, I hoped it wouldn't have happened. "We thought we'd deployed all the resources we could to make sure it didn't happen. "But unfortunately it did, so we're very upset, very, very disappointed and you know, I would say a big sorry to the people of Portsmouth." 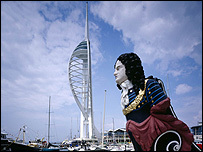 The tower, which cost £35.6m, overlooks Gunwharf Quays and has three public viewing decks and Europe's largest glass floor. Council tax-payers in Portsmouth had to foot the £11m-plus overspend. Visitors can enjoy views including Nelson's flagship HMS Victory, Portsmouth Naval Base, the Isle of Wight, the Solent, Portsmouth and the Hampshire countryside. A spokeswoman for its operators Heritage said: "There was a technical hitch. The lift stopped about 10 metres up for about one and a half hours but the engineers have freed it and it is working again. "It hasn't spoiled the day. The queues are moving quickly as people use the internal lift and there are a lot of smiling faces. "It is unfortunate but it's not a huge surprise. Lifts need bedding in, they are not entirely reliable." The tower was originally intended to open in time for the turn of the Millennium, but was beset by contractual problems and technical hitches. Safety concerns over the external glass lift, which operates in addition to an internal one, caused its opening to be further delayed since August. The Millennium Commission provided £15m for the project, with £5.8m coming from original contractor Berkeley Homes and another £2.7m of contributions in kind. Berkeley Homes later pulled out of the project and building work was carried out by Mowlem, under contract to Portsmouth City Council.